Harry Peulevé was one of the most remarkable secret agents of the Second World War. A former BBC cameraman, he was deeply traumatised by his experiences during the Dunkirk evacuation in 1940. Determined to erase the humiliation he felt after the fall of France, Harry joined the Special Operations Executive (SOE), a British secret service sending agents behind enemy lines to stir up resistance and "set Europe ablaze". Parachuting into France in 1942 he broke a leg on landing but made an amazing escape back to London, crossing the Pyrenees on crutches and breaking out of a Spanish jail. He fell in love with SOE heroine Violette Szabo but volunteered for a second mission, to lead a secret army of resistance fighters across south‐western France. Captured, he remained silent under dreadful torture before being deported to Germany with Violette, both destined for extermination in concentration camps. Though his comrades were executed, Harry made one of the most extraordinary escapes of the war. Disguised as a French prisoner, he would endure months in a punishment camp before making a run for the American lines to discover Violette's fate. 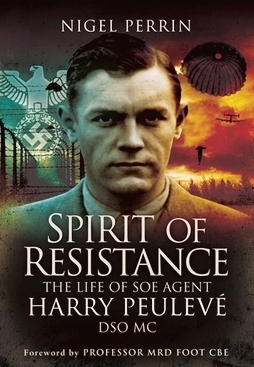 Drawing on Peulevé's unpublished memoirs and written with the support of his family, Nigel Perrin's Spirit of Resistance is the moving story of one of SOE's truly legendary characters.